08.13.12 Jarod Bryan captured the first place spot at the Downeast Open played at Southern Maine Community College in South Portland on July 21st. Bryan scored 4.0 points in four games. He was trailed by Matthew Fishbein and Mark Bourque with 3.0 points. Here's the tournament report with USCF crosstables and photos from the event. 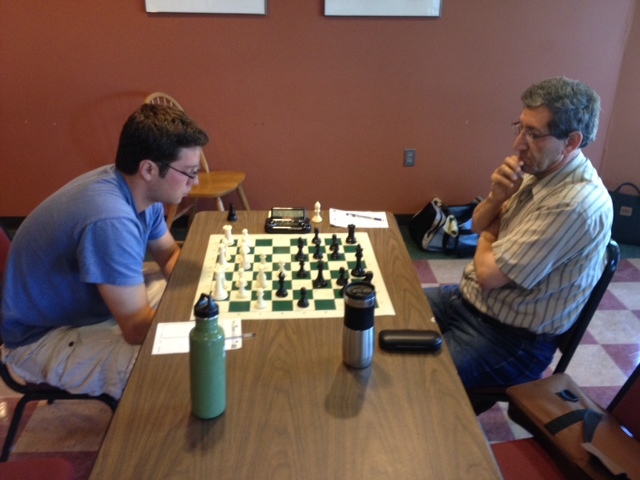 Tournament winner Jarod Bryan (left) plays Matthew Fishbein at the Downeast Open on July 21st. Thanks to Phil Lowell and Dan Fishbein for contributing to this report. Generally the USCF ratings held true to form in this event as there were no upsets in round one. The first upset occurred in round two when Connecticut expert Mark Bourque (2046) defeated Jason Spector (2147). Jarod Bryan and Mark Bourque were then the only two players with a perfect 3-0 score entering the final round. Mark was unfortunate in that he had a third game playing black in a four round tournament which occasionally happens with small sections. Jarod Bryan won the game to finish with a perfect 4-0 and notch his second victory at a Southern Maine Community College tournament this year. Mark Bourque won the U2050 prize scoring 3.0 points. James DuBois was the clear winner of the U1850 prize with 2.0 points. The reserve (U1650) section fielded eleven players and was a much different tournament than the open section. Five games were played in the first round and the lower rated player prevailed in four of the five. Only Frank DiRenzo managed to prove his rating was valid in the 1st round. After two rounds, Paul King from the North Conway, New Hampshire Chess Club and Bill Loring of Augusta were tied at 2.0 points apiece. Lisa DeBenedictis and Frank Direnzo were 1/2 point back at 1.5 - 0.5 as their game ended in a draw. King defeated Loring to go 3-0 while DeBenedictis defeated Ian Youth to remain 1/2 point behind the lead. DeBenedictis had elected to take a round four bye leaving her with a final score of 3 - 1. Paul King needing only a draw to take clear 1st place and was paired in the final round against Lee Doucette. A Doucette victory would create a multiple tie for first at 3 - 1. The Portland Chess Club President prevailed this time and the four winners were Lisa DeBenedictis, Frank DiRenzo, Lee Doucette and Paul King. The Rated Beginners Open drew six entries with two players playing in their first USCF event. Gheorghe Teodorescu took no prisoners and scored 4 - 0. William Ravn was clear second place at 3 - 1.Tied for 3rd and 4th were Charles Cremen and Mogens Ravn with a score of 2 - 2. Cremen took the 3rd place trophy on tie-breaks and Ravn was awarded the trophy for the top unrated player. Seven-year-old William Colglazier scored 1 - 3 and was awarded a trophy for top player U1000. 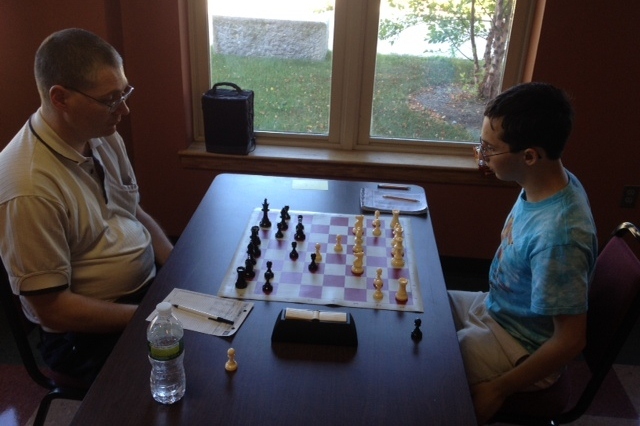 Joshua Quint (left) plays Max Berube in round three. 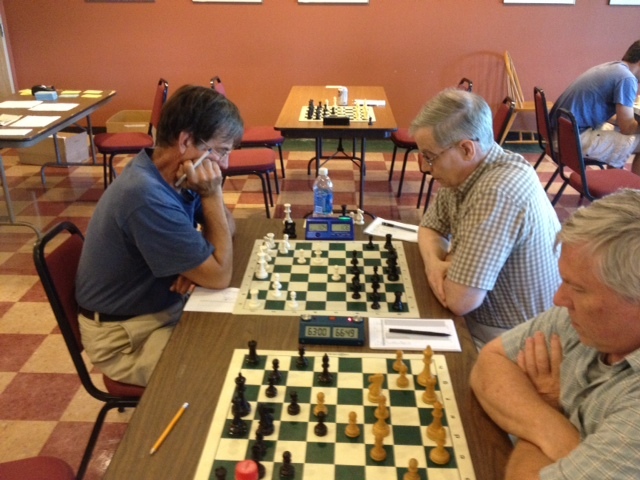 Bill Loring (background right) plays Paul King while Lee Doucette considers his position in his game with Dan Fishbein. 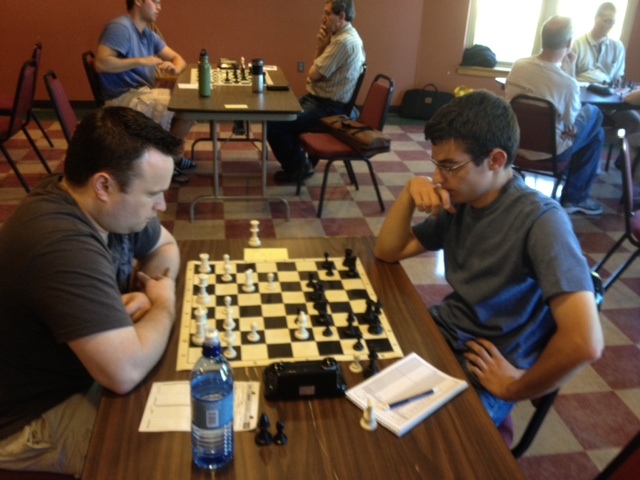 Ruben Babayan (right) plays Jason Spector in the open section. 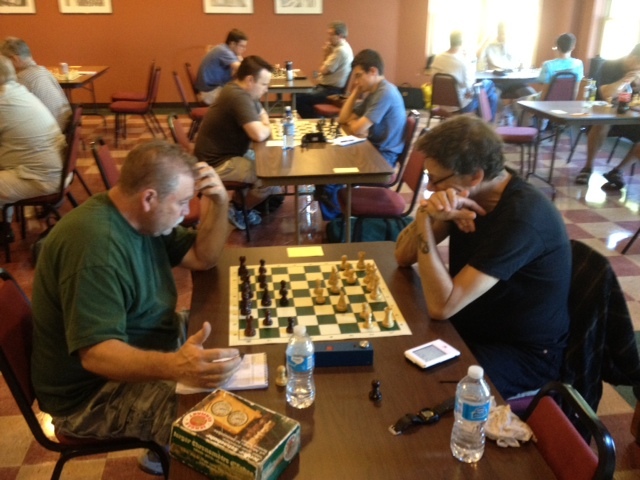 Jim DuBois (right) and Gregory Anderson tussle in round three.